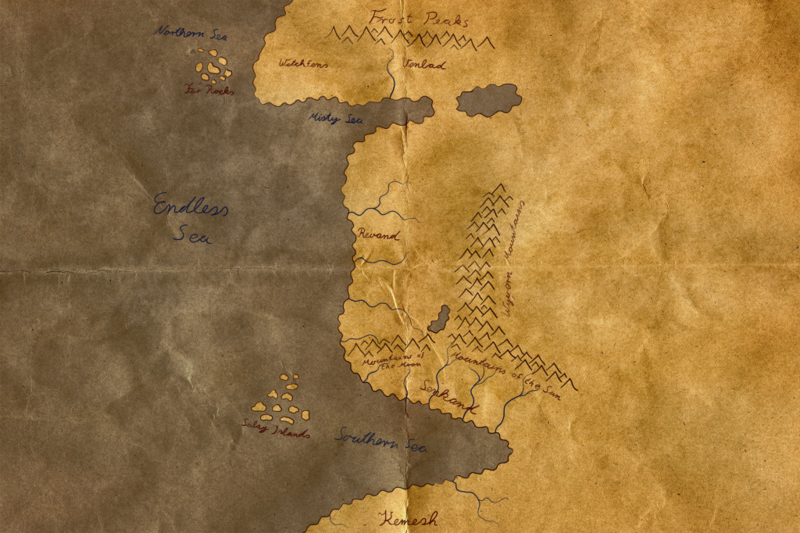 When creating a “world map” for a fantasy setting, I generally find it rather pointless to actually make a map that shows the entire world. Most fantasy worlds aim to be late medieval to early modern in the kind of world they describe and in these time periods much of the Earth was yet unknown even to the people with the most complete maps that existed. Also, an Earth-sized planet is massive and there is no way you could ever actually visit all those places, no matter how many books you write or games you play. At the very most, what a setting can practically make use of, is a region that covers all the major climate zones and ecological environments. While the distance from pole to pole is a bit over 20,000 km, the north to south length you need for a map that provides all the environments you could ever wish for is much shorter than that. I took some measurements on world maps and the numbers that showed up again and again were all in the range of 3,000 to 3,500 km. Or in fantasy units, 2,000 miles. It is the distance that takes you from the northern coast of Africa to the northernmost extend of the Baltic Sea. It’s the distance from Russia across all of Mongolia and China to northern Vietnam. It’s from Hudson Bay in Canada to Cuba and from Alaska to Baja California. The distance from Rio de Janeiro to the Falkland Isles. 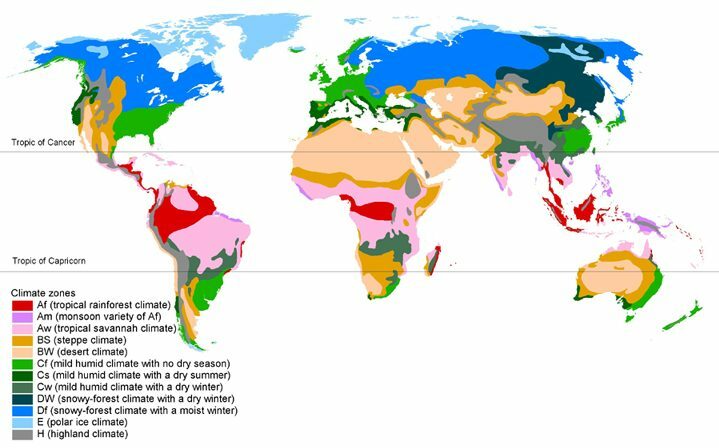 If you really want the full range of possible climates from the thickest tropical jungles to the permanently frozen artic tundra it’s more like 3,000 miles, but with 2,000 you are already on the pretty safe side in your ability to cover any landscapes you might want to put into your world. There’s been some maps of the Ancient Lands before in the past, so if you’ve seen any and remember them, the new map doesn’t really look much different than the old ones. 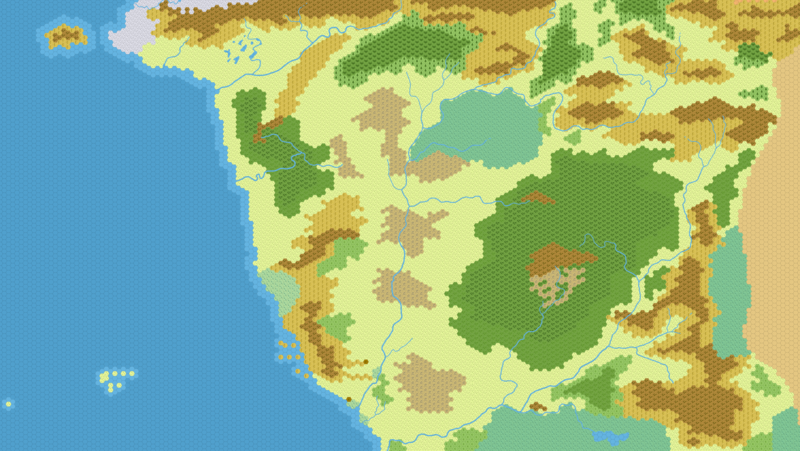 The lables seem to be pretty much unreadable, but I think the coasts and terrain are hopefully still fully visible. The main change I made was to remove the open plains of Sanved on the western shore of the Inner Sea and cover it all with forest again, which is actually what you would get on the eastern coast of a continent. (Deserts are always on the western coast because of wind patterns. Except Arabia.) 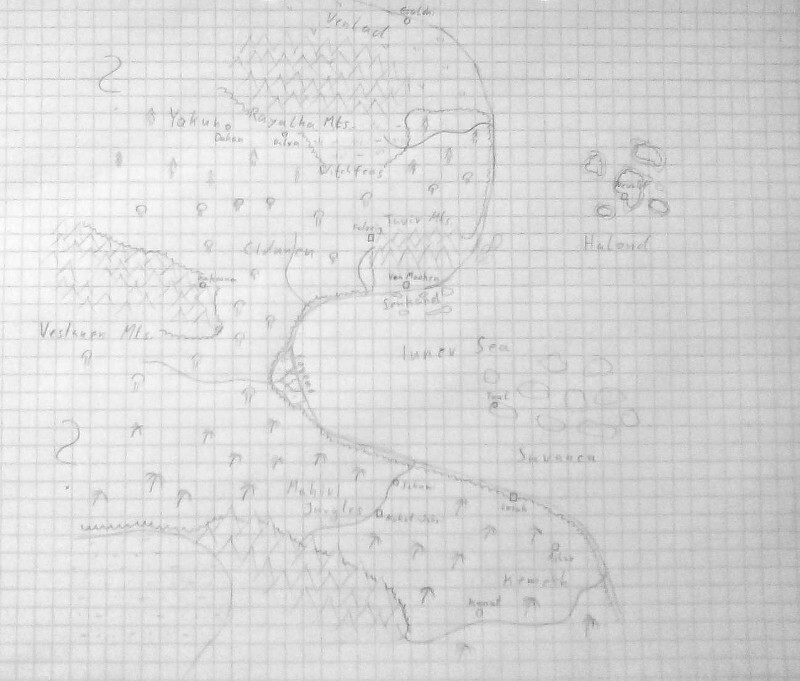 I also beefed the Vestanen mountains up in size and moved them a bit more south, as they will now be the new homeland of the Vandren. The Border Hills in the west and the Great Plains beyond them are now completely gone. Nobody knows what lies in that direction and when the forests might ever end. 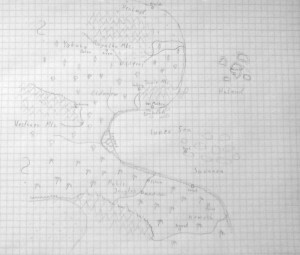 In the north I reshaped the Rayalka mountains a bit, but you might be able to make out that there is still a big question mark in the kaas homeland of Yakun. Got to do something with it, as I love the kaas, but that will have to wait for later. One thing my maps never show satisfactorary is the scale. This area is pretty huge. (Not when compared to those map nuts who do whole globes, but still distances that would take weeks to cover by ship and months on foot.) That bulge in the north is about as big as China and the whole map covers an area that ranges from the Subarctics in the north to the tropics in the South. Imagine you had the Russian pacific coast on the north edge of the map and Vietnam on the south edge. You probably could get all of Europe on this map (though perhaps without the northern parts of Norway, Sweden, and Finland). You might think that the sea coasts are boringly straight and there is going to be more detail in more refined maps, but mostly this is how real coastlines look like. Europe and Indonesia are the exception. Look at Africa, South America, and most of North America and you’ll see that there are very few bays or major islands except for the arctic regions. To get a familiar reference of scale for my own maps, I created this Hex map of the Savage Frontier region of the Forgotten Realms. If you’re interested in it, you can get it at full size here. A version without any map icons can be found here.